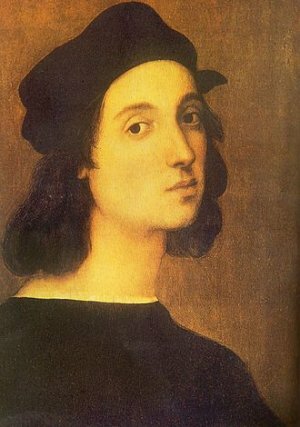 Raffaello Sanzio da Urbino, commonly called Raphael (RAFF ay el) was born in Urbino in the Marche area of central Italy. He probably learned to paint in his father's art studio. His mother died when he was eight, and he became an orphan when he was eleven and his father died. It was at this time he entered the studio of the artist Perugino. It soon became apparent that he was going to become a great artist. He studied the paintings of Michelangelo and Leonardo di Vinci and was greatly influenced by those artists. When he was twenty-one years old he moved to Florence and began to paint beautiful portraits. So many people wanted portraits painted by him! He could not paint fast enough to keep up with the demand, so he hired other artists to do parts of the paintings. 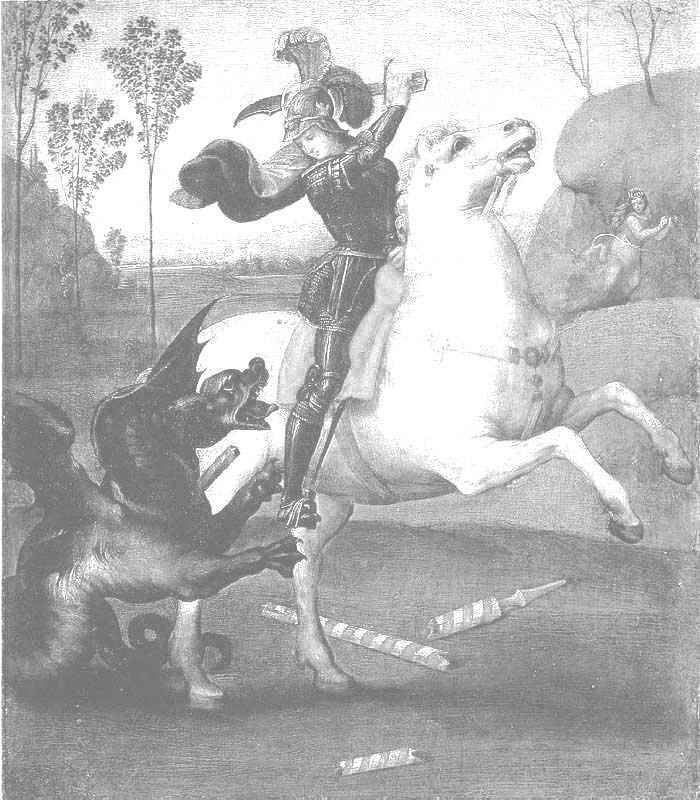 Raphael might paint the face and let someone else paint the clothing in the picture. 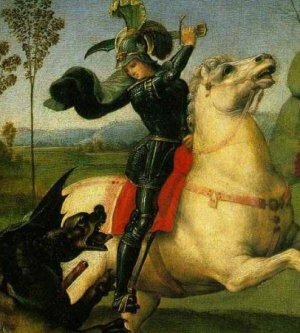 The featured painting on this page is St. George and the Dragon. You will enjoy reading the story behind the legend at Wikipedia.org. He became so famous that Pope Julius II (the Second) commissioned him to decorate his apartment in the Vatican, the home of the Catholic Church. Probably his greatest achievement was The School of Athens, a fresco in the Vatican. 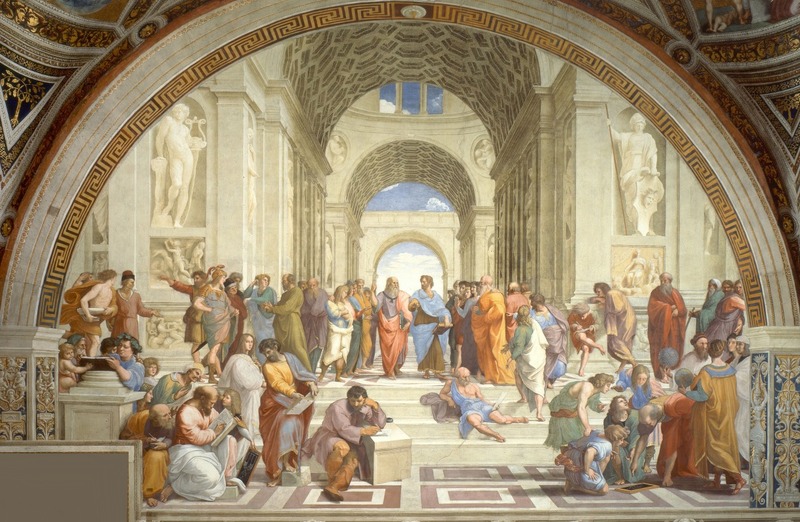 The walls of the Stanza della Segnatura already had paintings on them by other artists, but Pope Julius II ordered Raphael to plaster over them and make his own creation there of the School of Athens. 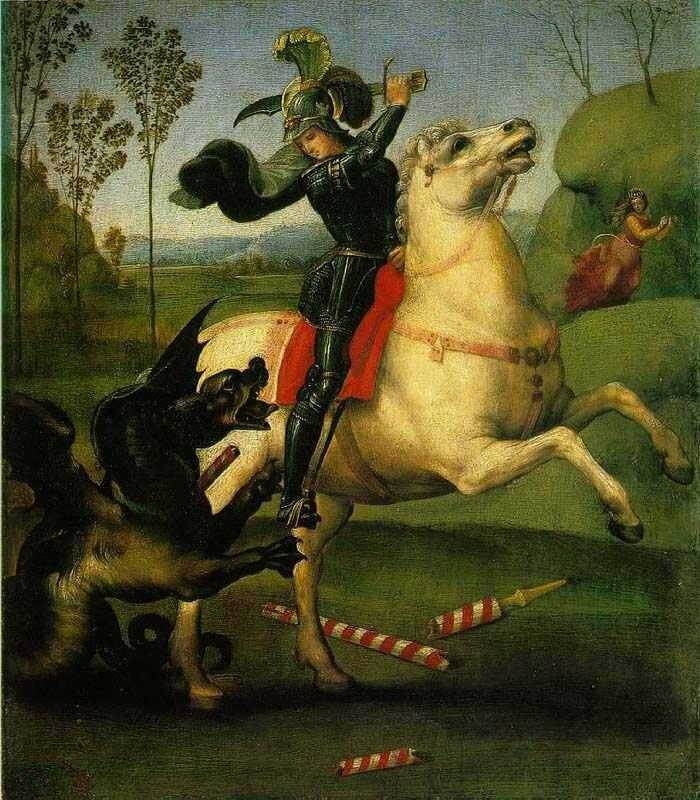 Raphael was 25 years old at the time. It is a large painting, more than 25 feet wide. 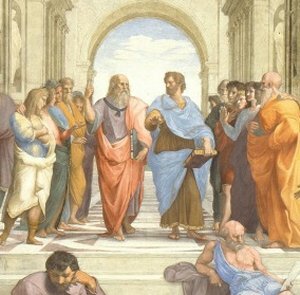 The two people in the center of the painting under the last arch are Plato and Aristotle who are standing side by side. 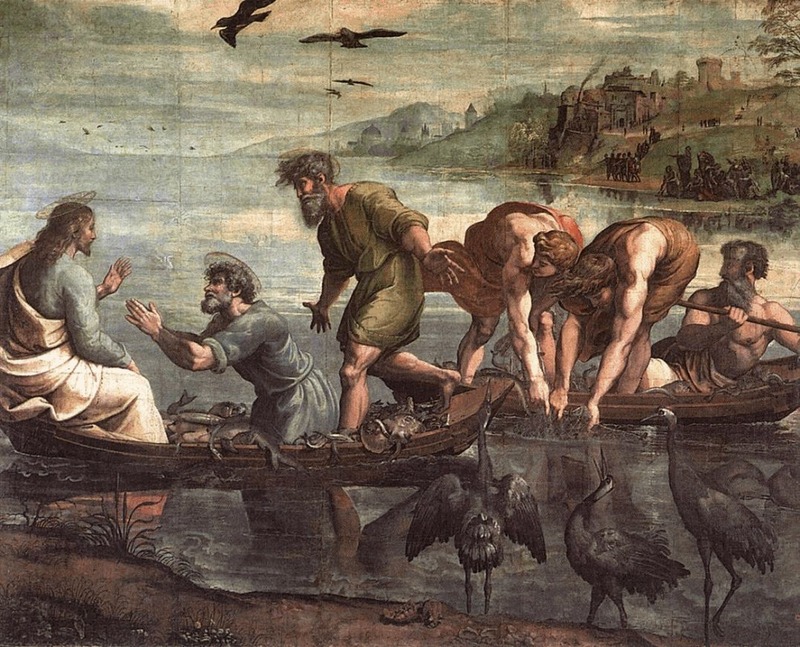 He painted Michelangelo as the hermit-like figure Heraclitus in the foreground. He put himself in the picture in the lower right. He is one of two people in the painting looking directly at the viewer. Can you find the other person? 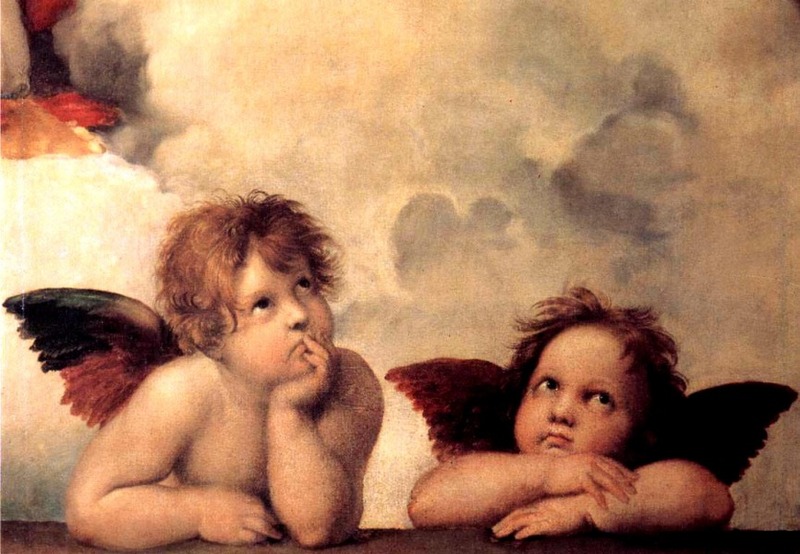 Raphael painted many religious pictures. The angels in the detail of Mary and the Christ Child have been used repeatedly on Christmas cards, stationary, and stamps. He created ten pictures known as "cartoons" from which tapestries were made. A tapestry is a picture made with different colors of thread woven to create the image. 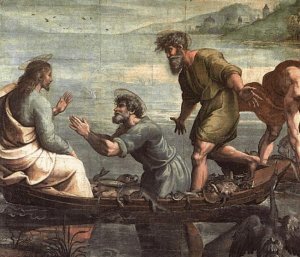 You can see an example in the tapestry The Miraculous Draught of Fishes which is in the Vatican in Rome. First he made the painting, then another person created the picture on a wall hanging made of cloth. 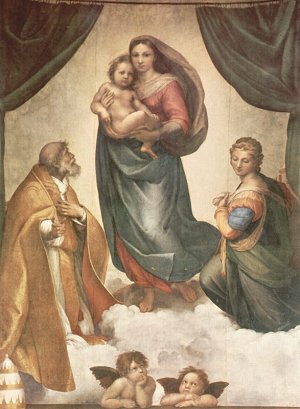 Pope Leo X (the Tenth) was the next Pope and he designated Raphael to be the architect and the director for the building of St. Peter's cathedral in Rome. He was born on a Good Friday, and he died on a Good Friday on his thirty-seventh birthday. He is sometimes called the "Prince of Painters". Press "Go" to search for books about Famous Artists. The story is in the Bible John 21:1-14. This page displayed 99,865 times.